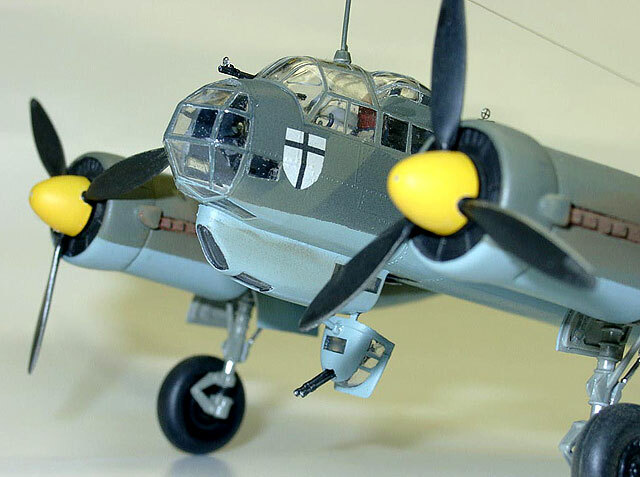 Here is the Italeri 1/72nd Junkers Ju 88A-4 converted to a Ju 88D reconnaissance version. This project was constructed as a gift for a WWII German Pilot. 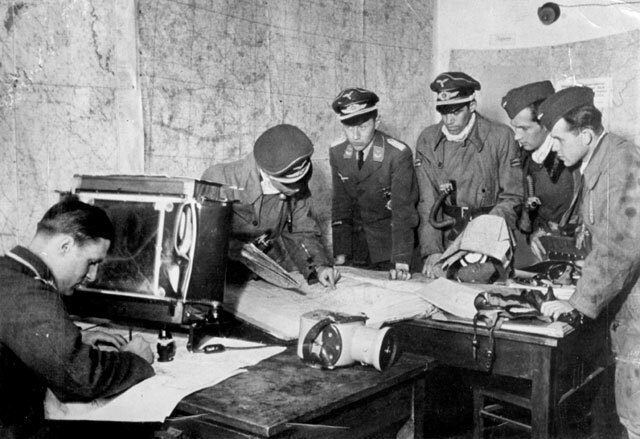 Dietrich Puetterwas a Ju 88 reconnaissance pilot on the Eastern Front with seven confirmed kills and was captured after his aircraft was rammed by a Mig 3 in 1942. 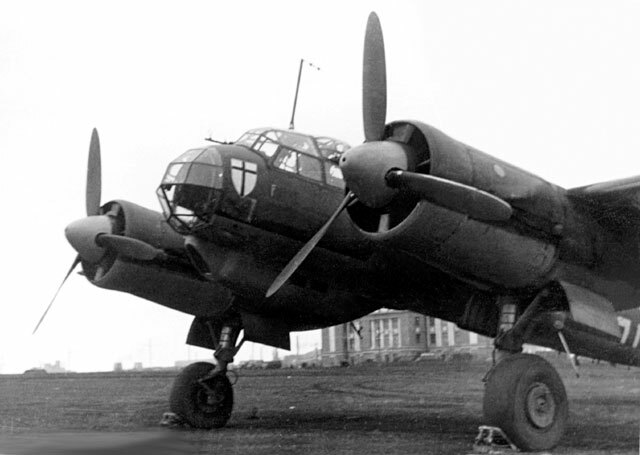 Based on the pilot’s recollections and a photo of his aircraft I determined the aircraft to be a reconnaissance version of the Ju88A-5. The nose badge showed this to be a member of KG 2. The colors of aircraft in this theater and the shading difference on the photo led me to apply yellow on the spinners, wingtip undersides and on the fuselage band. I used the fuselage code of T1 as this was the code for the 10th recon Group “Tannenberg” of which Dietrich was a member. 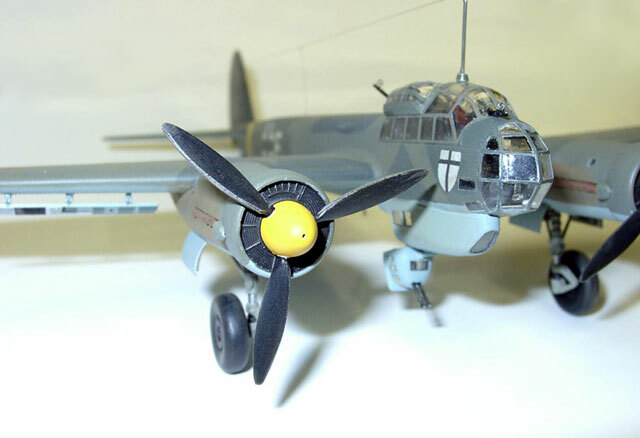 I used an Italeri Ju 88A-4 kit for this project. I had a hard time finding this kit as it has been out of production and not easily located. 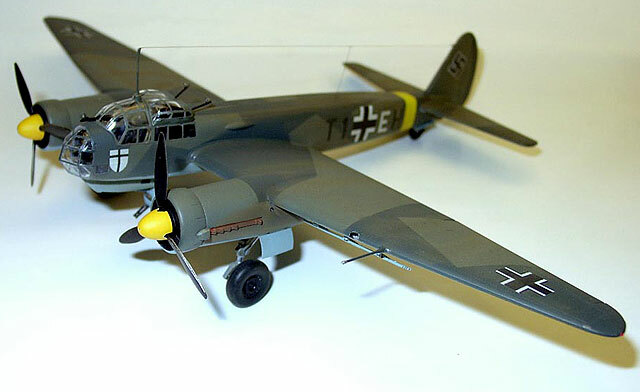 I have a Revell Ju88A-4 and a AMTECH J88S and I was going to modify the AMTECH to an A-5 Version with Revell parts. Luckily I found the Italeri kit at Hobby Island in Houston. Although this kit has rivets and raised panel line it was the best choice. The lines are subtle and the rivets were mostly removed with a light sanding. The landing gear was extended too far and this was easily shortened. I backdated this kit by changing the engine nacelles, filling and rescribing the rudder, reducing the cord of the propellers and adding camera lenses under the rear fuselage. The nacelles needed the lower sections of the A-4 engines removed and rounded to the A-5 engine profile. The rudder was backdated to an early A-5 by making it a straight up version and removing the forward protruding section. The propellers were reshaped from the wood of the A-4 to the thinner metal blades of the A-5. I added Eduard's pre-painted photo-etched seatbelts to the cockpit. I also modified the wing landing light from a square kit version to rounded lens. I used photo-etched gun sights and added wingtip lights from colored sprue. I used clear rod for the engine viewports and for the camera lenses. Finally I used Smoke invisible thread for the antenna. 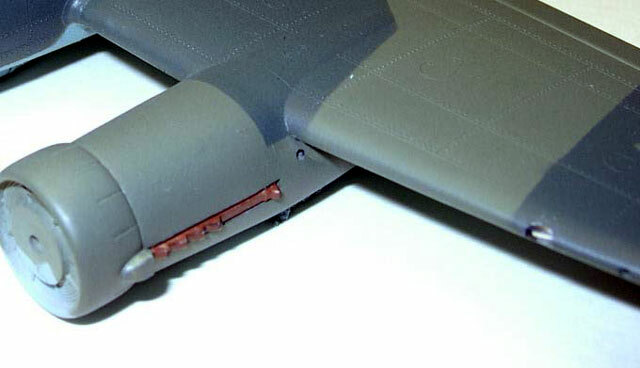 The engine nacelles were filled with putty and filed to the correct A-5 shape. The interior was constructed and painted dark gray and black on details. Dry-brushing was used to bring out the details. The seatbelts were added. 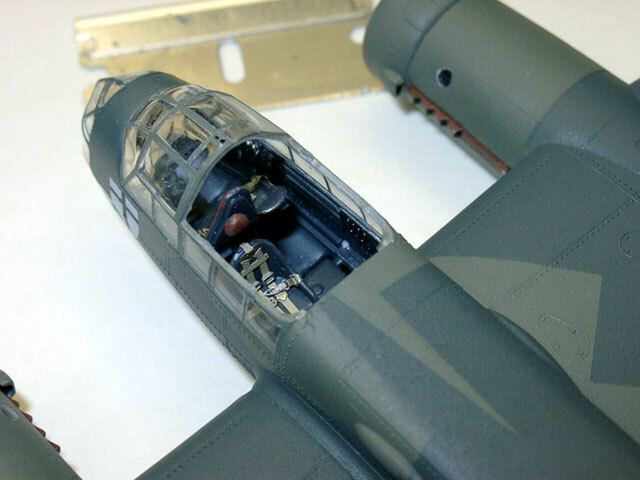 After painting the rear wheel and installing, the fuselage was closed. NOTE: The details in the cockpit interior were nice, but they were barely visible after the greenhouse clear parts were glued in place. The tail was modified at this stage. I installed the wings and the elevators with minimum filling. I dipped the clear parts in Future and allowed them to dry for a few days. They were installed at this stage and Italeri does something great, The rear of the canopy is a separate section almost like the actual aircraft. I did not need to install the weapons because I would remove the rear and add them after painting and finishing. Now, I installed the engines. I left off the exhausts, Landing Gear, Pitot tube and antenna until very end. I installed the rear canopy section with white glue and mask off the canopy. I used “Bare Metal Foil” for the masking. Tedious, but necessary project for this greenhouse canopy. I used a minimum of crazy glue and Correction fluid for seam filling. I also used Mr. Surfacer for filling some small seams. I scribed in any details lost during sanding. Not much in this project , pretty good fit! The entire model was primered with automotive sandable gray lacquer. This was rubbed down with a soft cloth to remove any surface blemishes. I used Mr. Color RLM 65 for the underside, Testor Model Master Acrylics for the Upper surfaces, RLM 70 & 71. I used an Aztec for the acrylic and a Badger 150 for the Lacquers, just my method. After the paint had dried, I sprayed Future on areas for decals, wings, fuselage, tail. I used Testor's Flat Acrylic after decals were on and dried. 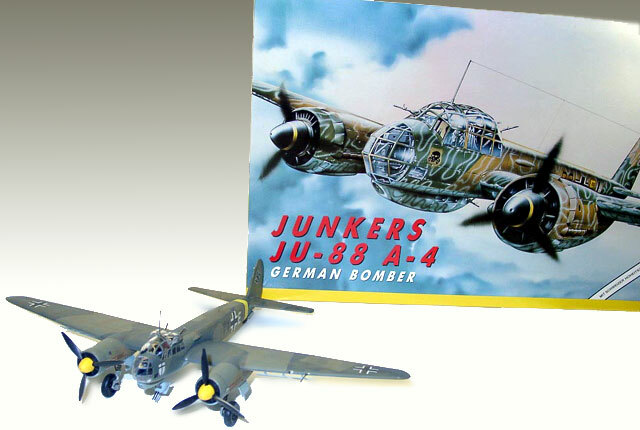 I used Techmod 7211P Junkers Ju-88A4/5 decal set. These were excellent. Decals settled down with one application of Micro Sol. One of the nicest decal sheets I have worked with. I custom made the shield for the nose with white decal paper and small black lines to form the crosses. I also handcrafted the T1 on the side of the fuselage. I hand painted the wheel wells and landing gear, and carefully installed and aligned these. I painted the exhausts (which were nicely done on this kit) and installed these. Pitot tube, antenna, belly guns and finished off with pastel weathering.